The weather is finally cooling off and it’s time to get your seeds sown. The Desert Botanical Garden in Phoenix has a great mix of wildflowers and one bag will give you more flowers than you can imagine. Start by raking the big pieces of tree and plant debris away from a sunny area. (You don’t want all the debris up because the organic matter will help fertilize.) This place should get at least bright afternoon sun. If the area is flat—or better yet, dipped a little—you will have the most success. Pour the seeds into bowl and spread in small handfuls. If you keep in mind to leave some areas alone, you will get a “patchwork” effect once they have sprouted that will look interesting and natural once they bloom in the spring. Water every other day while the weather is still warm. We don’t always get the rains in October that naturally help germinate seeds, so help them along. Just a few minutes is all it takes. I usually water while enjoying my cup of coffee in the garden. The easiest way to water is to run a sprinkler line into the area and fit a head on that sprinkles just the area where you put seeds. This is best for people who are out of town during this crucial time of year. Within weeks you will begin to see sprouts. 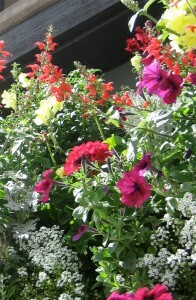 A note on Penstemons: These showy, long-lasting annuals take over a year bloom. If you want them in your garden this year, best to buy the plant. Otherwise, your best bet for healthy Penstimons os to start with seed and be patient. You will not be disappointed.